The sounds of six kids looking up at a TV with a microscope connected to it fill the room at Tire City Potters, as owner Shishir Chokshi excitedly points to an image of two gray globs expanding in a hurry. The globs are yeast in a bowl with sugar, and it’s drying out in the microscope – the results of a previous science experiment done in the morning. What’s odd about this picture is Chokshi, a GRU alumnus, is an artist – not a scientist. 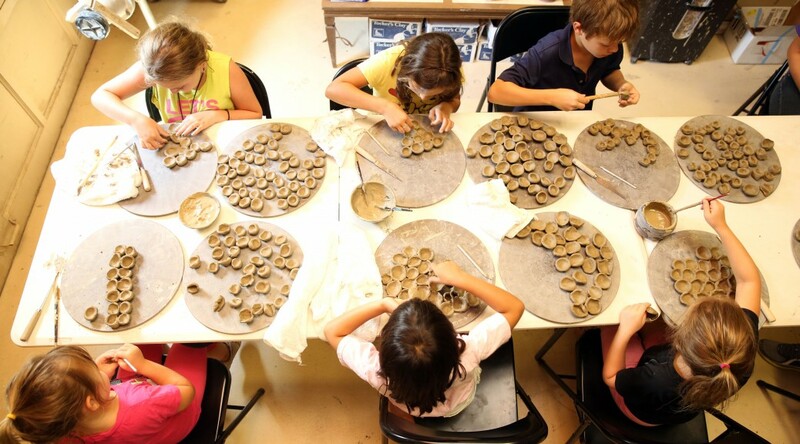 But as the kids are working with clay to create cells to form different microbes, the pieces begin coming together of a rare relationship between art and science in a program dubbed Living Clay. “We’re using art to make science understandable,” Dr. Erhard Bieberich said. He is a professor in GRU’s Department of Neuroscience and Regenerative Medicine in the Medical College of Georgia, and his friendship with Chokshi as a supporter of the studio birthed the idea of this camp. He walks around the rectangular table and asks one girl, Skyler, if she’s showcasing cell division in her clay art (and receives a vigorous nod of approval). The morning session brings the science, as Bieberich talks about different subjects: The five kingdoms, how bodies fight diseases, what parts of cells do. Sometimes there’s time to finish the previous day’s art projects, but sometimes the kids have headed outside to put chalk to sidewalk and visually show what they just learned under Chokshi’s supervision alongside two GRU student volunteers. After lunch, it’s more art, ranging from building cells to making a paramecium in water out of different materials. How does one come up with an idea to bring together two seemingly separate worlds in the first place? Middle school. “I started going to middle schools to teach, and I would use soap bubbles as demonstrations,” Bieberich said. A test run was done at the Aiken Bluegrass Festival in May to help visualize the camp’s concepts, as kids and volunteer students sculpted microbes out of clay. With an art studio as the environment, everyone is learning something. “As a scientist used to speaking to my peers, learning how to speak to a younger audience has made me rethink how to speak and approach different topics,” Bieberich said. The beauty of using art to apply science is the parallel in the process. With an art project, there’s a fair amount of trial and error – and if the artist hits a roadblock in the process, then a way to adapt must be found. The same is true in nature, as different genetic outcomes produce subjects that have to survive. Sometimes, things mess up. Both men are using this camp as a trial run, figuring out space requirements and what works well both on the science and art fronts with the kids. They hope to have access to better technology and more space next summer so they can offer the camps to a wider age range – and to more students. While they could tailor specific experiences to individuals now, both agree they would prefer to have the time to enhance the program’s infrastructure before making it public again. “One thing I’ve learned is to be flexible – a kid could say one thing and it’s a great idea, so we change the project to encompass where they are with their understanding. They retain so much information, I’m shocked. The physical activities are reinforcing what they learn,” Chokshi said before telling the kids he’s impressed with the structures they’re creating out of the clay cells they’ve made. An undeniable fact sits on the table among the clay cells as part of the day’s project: These kids get it, between the audio, visual, and kinetic learning processes they’re experiencing. Previous PostTIME: GA Gov. pushes trials of marijuana derivativeNext PostCEPaR Corner: What does a Decon Team do?